Aunty Joyce's 85th Birthday Bash! 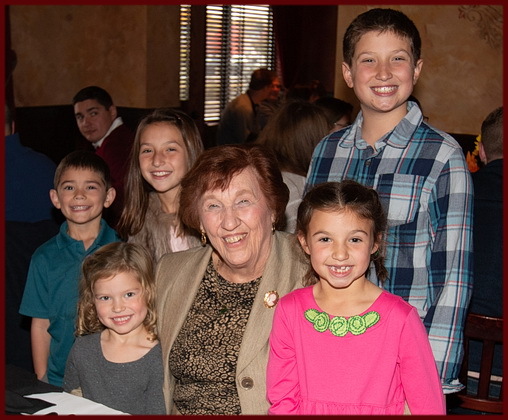 October 28th, a gray drizzly overcast Sunday, was brightened considerably by the love and affection shown our own Aunty Joyce as we gathered at Gianni's restaurant in Palatine to celebrate her 85th birthday. Organized by her girls, Diane, Sue & Barb, Aunt Joyce held full command over the crowd that also included most of her Grandchildren, many of her Great Grandchildren and a smattering of adoring nieces and this nephew. Son-In-Law Joe offered a prayer of thanks for the blessings of Aunty in our lives, followed by Joyce's youngest daughter Barb with a lovely toast that can be seen in the Video link above. Joyce's girls laid on a tasty brunch at the restaurant and across 3 large tables we all celebrated "The Night Owl's" birthday - who looks absolutely splendid on this her 85th trip around the sun. 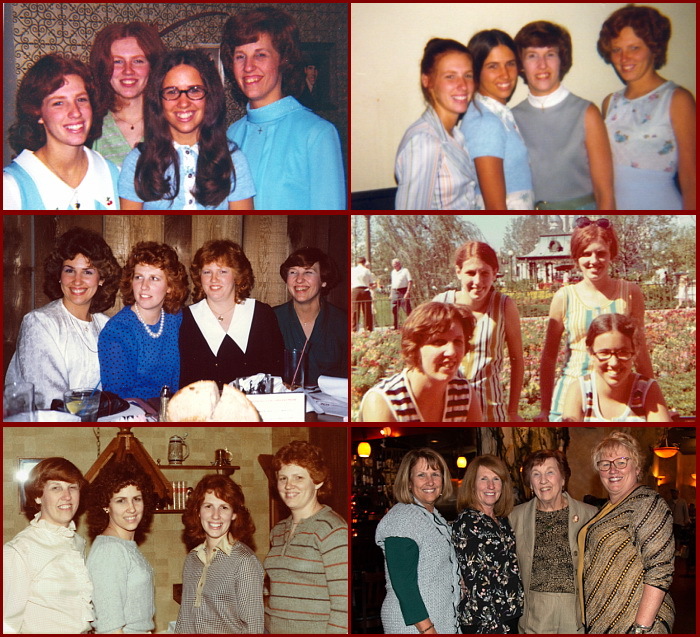 To the left is some Then & Now snaps of Aunty with her beloved girls over the years. Picture upper right is Joycie with a few of her darling Great Grandchildren. My three sisters, Laurie Jean & Nancy wouldn't miss the event as we have grown up our whole lives with Aunty Joyce and love her dearly. Though Randy & Steve attended, sadly my Kathy was away in Florida and couldn't attend. Kathy as you know, is the current title holder of the "Aunt Joyce Award" which is bestowed upon the Johnson female who literally loves everyone, always says something good about a person - no matter how wretched the person might be, and is beloved by all. However, Kathy will find it difficult to retain the Aunt Joyce Award as Joyce's Grandaughter Aly is closing hard down the stretch. With youth on her side, Aly may soon dispatch my Kathy in a flourish of love and kindness that she inherited from Joyce herself. Formidable. All our love Aunty as you celebrate your 85th Birthday! Thanks & Praise to God for blessing us all with her!